A Montana freelance writer and professional ski instructor relates her story of chasing winter to the far north, and finding unseasonal warmth … along with lessons about Icelanders' changing climate. Iceland’s Tröllaskagi Peninsula sits just below the Arctic Circle. Photo by Donny Roth. TRÖLLASKAGI PENINSULA, ICELAND – April 29-May 4. The snow has a peculiar glassy glint, reflecting the light of a fine Arctic morning across countless summits, cirques, and snowfields. At first glance, the scene is postcard-pretty. But the slope reveals the troublesome nature of this snow. It had rained the previous week, even at high elevations, and now the surface has re-frozen. An icy veneer sits atop the snowpack. Under it, the snow is rotten and mushy, the cumulative result of prematurely warm temperatures. Along with a trusted mountain guide friend, the climbing and scenery keep us happily occupied for a while before we reach the ridgeline and ponder our choices for skiing down. Normally the descent is the fun part of the equation, but surveying our options was akin to Goldilocks musing over her bowls of porridge. Snow in the sun is already too warm and soft. Snow in the shade is mantled by the ice crust. I set off down the slope, seeking the “just right” zone of ski conditions. The first few turns are reassuringly nice, until the skis bog down into the slushy snow, slowing my momentum and pitching me forward. I regain balance and adjust my line toward the shady side of the slope, only to collide with soccer-ball sized chunks of re-frozen avalanche debris. The Goldilocks zone was nowhere apparent. 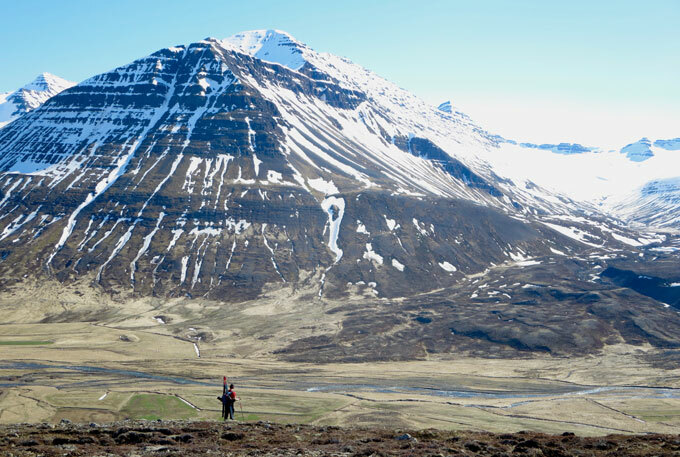 The author descends one of Iceland’s many glacial cirques. Photo by Donny Roth. 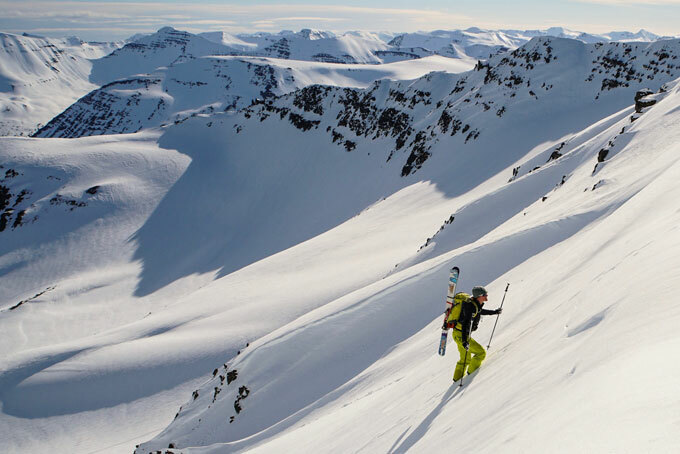 This was our third trip to Iceland for human-powered skiing. Each year we hike, climb, and occasionally crawl to the tops of isolated mountains, earning the sweet reward of slicing arcs down huge slopes. But this year, we’d been skunked. 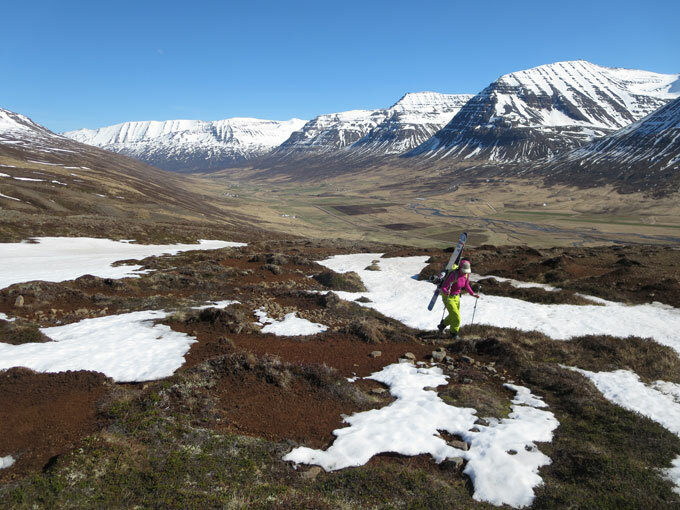 Iceland had an anemic winter, with stingy snow that arrived late and was leaving early. As with most places around the globe, Iceland had its warmest year on record in 2016. In northern Iceland, the months of October, November, and December were all more than 5.4 degrees F (3 degrees C) warmer than the historical average, setting the stage for an oddball winter. As Icelandic meteorologist Trausti Jónsson explained in a news article, “The swings here in Iceland tend to be double what you see elsewhere. Which means that we can see one extreme shift after the other, we fluctuate wildly around the global trend.” This process is known as Arctic amplification, and until now it was a concept I’d only read about. But its imprint was palpable – “up close and personal,” as they say. Siglufjörður’s harbor was once the epicenter of Iceland’s herring industry. Photo by Karin Kirk. 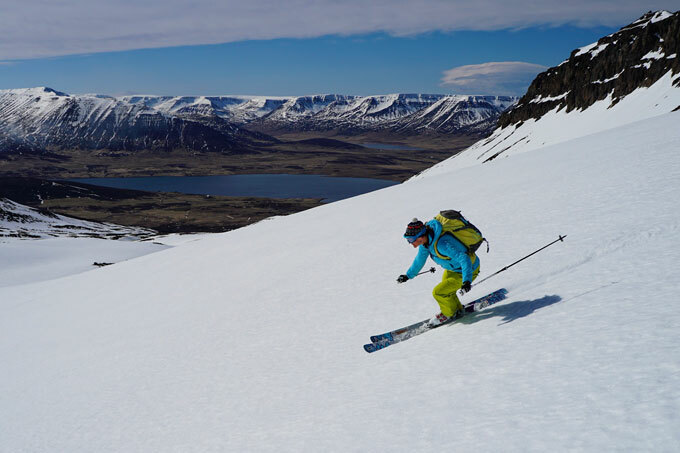 Nestled far below our ski boots, the tiny town of Siglufjörður is no stranger to the tricky dance between natural resources, economic need, and the forces of nature. Siglufjörður was once the epicenter of Iceland’s herring industry. The village was home to fish-processing factories, a fleet of fishing ships, and a gold-rush atmosphere of prosperity and opportunity. Herring sustained Iceland through the Great Depression, stabilizing the economy and helping it achieve independence from Denmark in 1944. The herring population wavered through the 1940s and 50s, and then in 1969, the herring simply failed to arrive. Aggressive overfishing had done in the fish population. Iceland’s response to this crisis: A near-moratorium on herring fishing was enacted, which lasted 25 years. The herring since then have rebounded and large-scale fishing has resumed, now heavily regulated. Only around 20 percent of the total herring population can be fished each year. As the fish population varies, so too does the quota, putting the industry on a path to sustainability. With a history of managing a balance between nature, humans, and economics, one can envision Icelanders’ having a valuable outlook on climate change. I set off to find out. Tómas Sigurdsson, like most Icelanders, has a lot to say about the weather. He offers me coffee at least three times before settling down on the velveteen sofa of his living room. His petite calico cat looks on as Tómas tells me about Iceland’s winter. You might expect someone who lives in one of the harshest climates in the world to celebrate a mild winter. But that is not the case. Icelanders live in lockstep with the natural world. Perhaps because they have to. The forces shaping the island are not subtle. Volcanic eruptions, storms, avalanches, and floods are routine events. Not to mention winds so strong that you can lean into it like a ski jumper and not fall over. When the weather’s not right, there’s cause for concern. Even when it is right, it’s still brutal. But the Icelanders’ ability to take it in stride is part of their pragmatic charm. Tómas and his son Hilmar live in the most stately house in the Siglufjörður harbor. This hardy fishing village is tucked into a fjord on Iceland’s rugged northern coast. 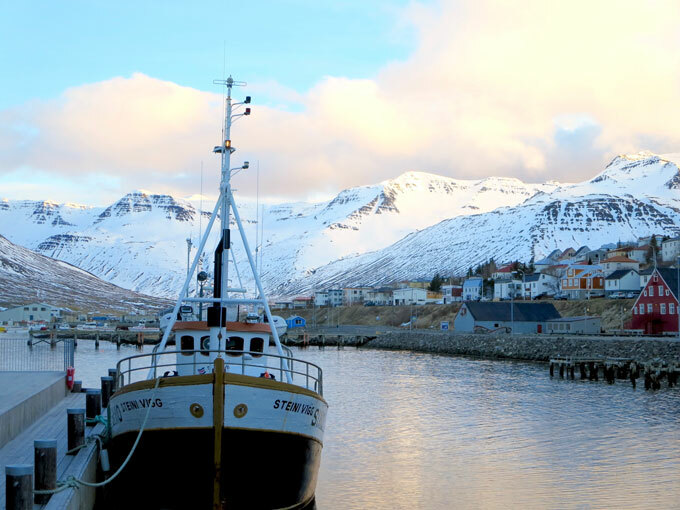 Glacially sculpted peaks soar above water churning with seabirds and adorable fishing boats. The valley bears the graceful U-shape of its former occupant – a Pleistocene glacier. Tómas’ son Hilmar enters the living room, surprised to see a guest. Tómas introduces us and seems relieved to have his son take over my inquiries. Hilmar appears happy to do so. His English and his thoughts come quickly. He’s in his twenties, and has lived in Florida, but is very much an Icelander. “What do you think of climate change?” I ask. Iceland has an advantageous setting for natural energy. The country straddles the Mid-Atlantic Ridge, the tectonic seam that splits open the ocean floor and ignites perpetual volcanic activity. Geothermal hot water provides heat to most Icelandic homes and also recharges the nation’s beloved hot springs. Meanwhile, Iceland’s location in the North Atlantic assures it is bathed in near-constant precipitation. Iceland’s rivers are fierce, and are the source of more than enough hydropower to keep the lights on through the long winter nights. A sign at Keflavik airport sings the praises of renewable energy in Iceland. Photo by Karin Kirk. Supporting Trump … but not on his climate change views. Photo by Karin Kirk. 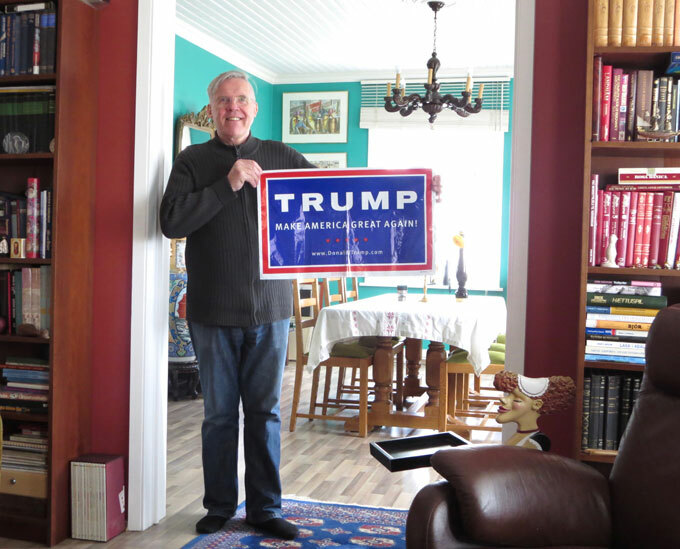 While Hilmar sings the praises of Iceland’s progressiveness, his father, with a mischievous twinkle in his eye, unfolds a TRUMP – MAKE AMERICA GREAT AGAIN banner. Hilmar rolls his eyes and shakes his head, “He tried to hang it outside, but I wouldn’t let him.” I snap a photo. Departing in a stiff breeze, I can’t help but chuckle over the Trump banner. Even innocent Iceland isn’t immune to our fractious politics. Siglufjörður’s harbor has undeniable appeal, even from way up here. Photo by Karin Kirk. The next morning graces northern Iceland with stunningly clear skies. The water in Siglufjörður’s harbor twinkles a shade of sapphire blue normally reserved for overly manipulated Photoshop images. We thread our way southward through a series of tunnels connecting tiny fishing villages along the Tröllaskagi peninsula. 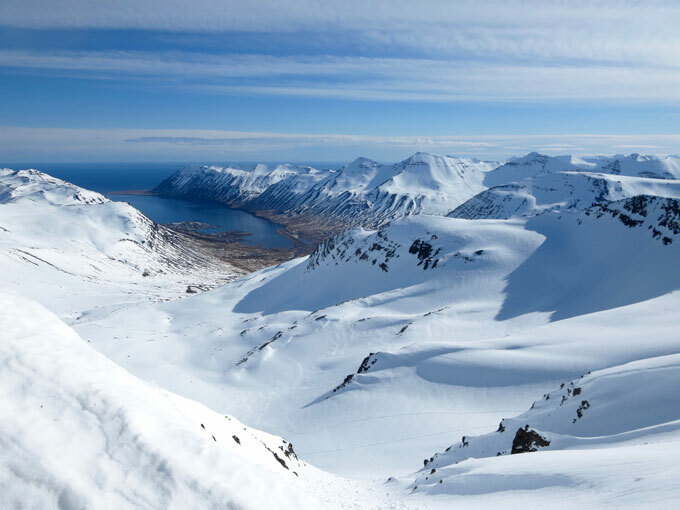 We emerge in Dalvík, and head up the broad valley of Svarfaðardalur, our most treasured skiing locale in years past. As we meander past farmsteads and up the valley, we ogle at slopes we’d skied in prior years. On that day, the mountainsides are a sad patchwork of white snow and black basalt. We arrive at the trailhead, which is lush with grass. The snowline lingers about 600 feet up the slope. It’s 65 degrees F. We feel foolish in ski clothes. Nonetheless, we load our skis on our backpacks, shrug our shoulders, and start walking uphill. Skiers gotta ski. Setting off for a day of unlikely skiing above the Svarfaðardalur valley. Photo by Donny Roth. The ascent up the glacial moraine is surprisingly easy. The soft mounds of heather make for leisurely walking. Behind me, the braided river courses with meltwater, fed by the diminishing snowpack and dozens of waterfalls threading down the basalt cliffs. I wasn’t too anxious for the skiing, so I pause to soak up the scene. A dozen greylag geese coast in for a landing in the broad floodplain, seemingly laughing and gossiping amongst themselves. Overhead, a common snipe fans out his tail feathers while descending sharply toward the ground. The resulting pulsating sound is intended to attract females, but to me it sounds just like a cartoon flying saucer. A band of Icelandic horses seems energized by the fine weather and strikes up an animated lope across their pasture, with occasional bucks and hops thrown in for good measure. Quite literally, kicking up their heels. This valley is one of the happiest places I’ve visited. In fact, it’s helped me define my own meaning of happiness. The mountains, the river, the animals, and the people all knit together in a way that I’ve never experienced elsewhere. Each time I return here, the feeling is the same. Whether in knee deep snow or ankle deep grass. There is no tension. No pollution, no ugly intrusions. I don’t worry that the birds will swim in polluted waters or the lambs will grow up in a feedlot. Because they won’t. This scene has remained unchanged for hundreds of years, with a light touch of humans and a heavy hand of nature. The inhabitants, human and otherwise, have no choice but to ride out the ups and downs of climate and volcanoes and economic collapse. Yet the river pulses just the same, nourishing the landscape and ushering the melting snow into the icy blue fjord. I’m grateful to be able to experience a place like this. It’s vibrant with natural energy, and thanks to the stewardship of a respectful culture, it’s likely to stay that way. I draw in a deep breath of warm, clean air and realize that the lessons learned here are far more enriching than even the best skiing can offer. In Iceland, one individual’s influence appears dwarfed by natural and other forces. Photo by Karin Kirk.